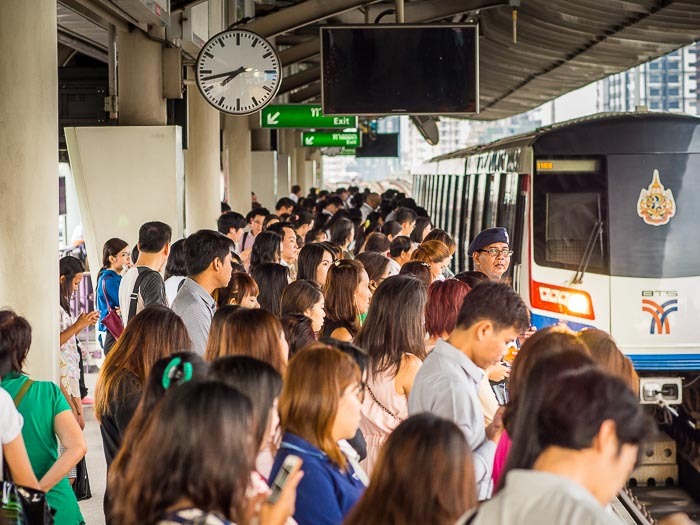 Passengers going into the Bangkok Central Business District line up for an incoming train on the platform in Saphan Taksin station. The Skytrain, also called BTS, in Bangkok is a wonder. It's hands down the quickest way to get across town in a city with world famous traffic jams. The system opened in 1999. 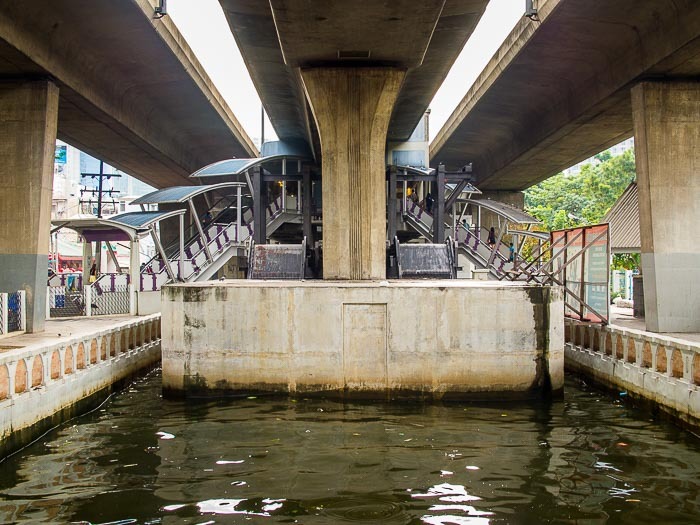 The Silom line terminus was at Saphan Taksin, a bridge over the Chao Phraya River and the pier where commuter boats from provinces north of Bangkok stopped. The line goes down to a single track at the bridge because there isn't room on the bridge to build a two line track. Passengers jam into a Bangkok bound train at Saphan Taksin station. Fast forward 15 years. Ridership on the system has grown from just 200,000 passengers a day in 1999 to about 650,000 riders per day in 2013. On December 22, 2013, more than 750,000 riders jammed into the BTS (this was a day of mass political protests in Bangkok and the city was gridlocked pretty much everywhere as protestors went from protest site to protest site). Most trains, even off peak, are standing room only now. The network was expanded through the years. Now Saphan Taksin is a middle stop on the Silom line that extends well into the Thonburi side of Bangkok. Now the decision not to build a two track line on the bridge is haunting transit officials. 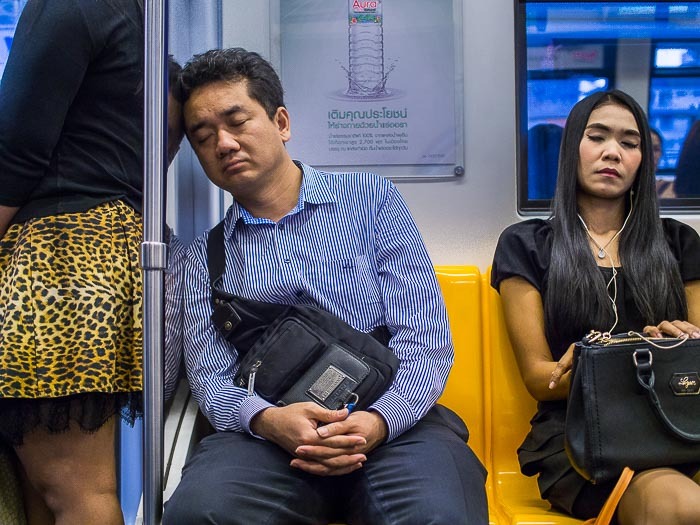 Passengers doze on the Silom line. What was the terminal station of the Silom line is now a bottleneck. Because there is only one track across the river, trains have to wait on the Bangkok side before coming into the station. The solution seems to be shut the Saphan Taksin station. The Bangkok Metropolitan Authority wants to build an elevated moving sidewalk from Surasak station to Saphan Taksin. The two stations are about one kilometer apart. Surasak is on the edge of the Central Business District, making it the river stop will certainly raise its profile. But one kilometer, even on a moving, shaded, sidewalk is a long ways and there is no timeline for finishing the moving sidewalk so commuters face the prospect of a long walk in Bangkok heat to get to the river. Saphan Taksin station may soon be closed. It will become an architectural relic. I always thought it looked like something out of "Blade Runner" from this angle. At this point there is also no timeline for closing the station, but the issue seems to be generating a lot of urgency in the last couple of weeks. 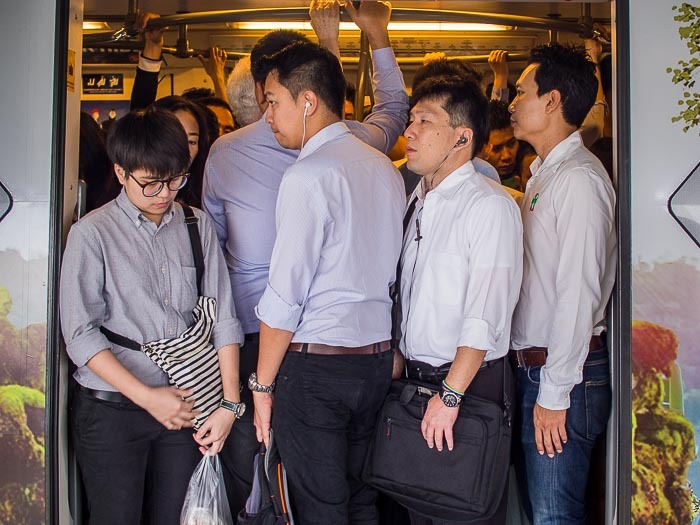 There are stories in the papers almost every day about plans to close the station and relieve congestion on the Silom line. Honestly I don't see how closing the station will relieve congestion. There will still be just one track across the river. Trains will still not be able to pass each other on the bridge, so trains on the Bangkok side will still have to wait for trains from Thonburi to pass. There are more photos of the Bangkok BTS in my archive.